Please refer to here for more information about 26-bit HID card. The 26-bit HID card (H10301) is according to the industry standard format and it is an open format card. The ranges of card numbers available in this format are limited and therefore the card numbers could be duplicated. 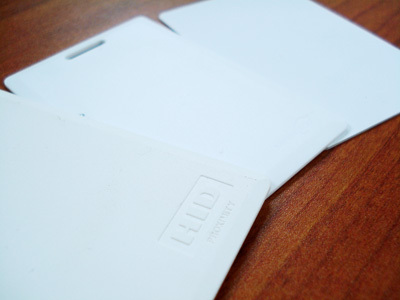 HID does not control or restrict the ordering of cards encoded with the standard 26 bit format. Convenience in ordering cards and universal access control panel acceptance are the primary benefits in using the standard 26-bit card format. The 26-bit HID card consists of 255 possible facility codes and within each facility code there is a total of 65,535 unique card numbers. How does the facility code (or site code) work? A 26-bit HID card has the format “1-11111111-0001011111101100-1”. The first set of ones in red representing the facility code and the second set of ones and zeros in blue representing the credential number (card ID). The access control system sees this format as card number 6124 with a site code 255. 1-11111111-0001011111101100-1 (HID card data) = Card ID 6124, Facility Code 255 (System display). As mentioned, each facility code can pair with 65534 HID cards. There are total 255 facility codes, and it can maximize total of 16711170 pieces of HID cards with 26-bit format. This can minimize the chance for HID card users with duplicated cards. At the current stage, the FingerTec® models that support HID cards do not read the facility codes. The R&D is developing a new firmware to upgrade these models to read the facility codes. An upgrade to the software TCMS V2 will be done to support the facility codes too.